A Special Prosecutor. A new Ya Naa. Creation of New Regions. A right to information law - after almost two decades of parliamentary debate - This looks like Change in my books. This President has surprised some of us, for the good and for the bad. Yes, there is massive corruption going on in this current NPP government. Don’t ask me for evidence when it is self-evident. Due to this, the government is struggling to prosecute past NDC government officials who allegedly engaged in corruption and willfully causing financial loss to the state. ( scratch my back and I scratch your back) so you see how NPP/NDC is playing chess with we-the-people..;))? Nobody wants to catch the thieves because everyone who took charge is a thieve. Today, where is the Woyome money? Has the NPP government retrieved it for the state yet? Why aren’t they interested? hopefully my good uncle Martin Amidu the special prosecutor will take the side of the people. I want to believe that the President is committed to the war against corruption - even if partially - otherwise he will not appoint a principled and uncompromisingly uncontrollable man as the SP to fight corruption. As for you those who claim you have lost hope in Martin Amidu, you never had hope in him in the first place. You always wanted the man to fail. You are now only just simply trying to discredit him to fulfill your own fake prophesies - but you don’t know the man yet. 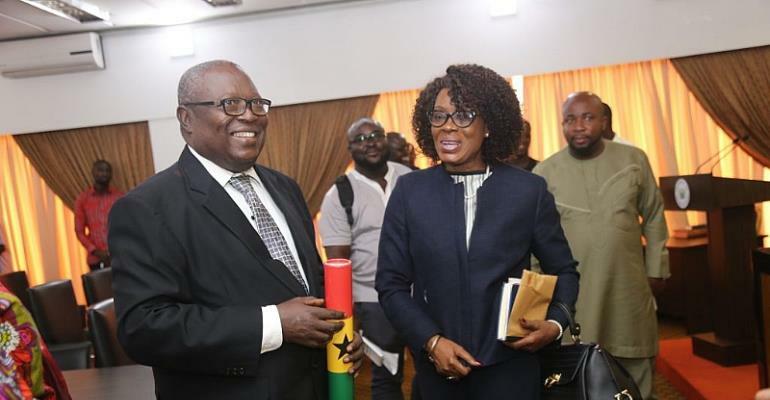 Martin Amidu appreciates the enormous responsibility on his special shoulders to hold both NPP and NDC corrupt officials to face the law and account to the people. He said recently that he is working quietly despite facing logistical, Human Resources and budgetary constraints. Without Martin Amidu, we should forget about the NPP government fighting against corruption. With him there is hope! I still don’t believe that creating new regions will lead to accelerated improvement in the social and economic conditions of the people. To me, the President should have focused on creating more local governments and let we-the-people elect our own MCEs and DCEs in a popular vote as he promised us. Creating new regions is too expensive with no clear benefits, except jobs for the boys/girls. That is my arrogant opinion. But the President has created it and it is a monumental change in public administration in this nation. There seems to be so much excitement although names and location of regional capitals is a source of violent conflicts in these newly created regions. These will have to be contained. The deed is done. from the Dagbon people themselves. But which President wouldn’t claim political credit for such a fortune? Even more monumental in an effort to ensure transparency and accountability in government, the 7th parliament of the 4th republic has created the right to information law. The bill for this law has stayed in parliament for nearly two decades and has undergone countless amendments. Now that the law exists, it is now our responsibility as citizens, civil society, journalists, political parties, individuals etc to demand the enforcement of the law compelling governments and parastatals to release information demanded by the public for the purposes of transparent governance. These are indeed bold changes. But the President isn’t done yet without one last monumental cathedral which he intends to use to secure his entry through the pearly gates. Mr. President is not doing this one for the people but for God. That’s why he won’t listen to the people who are denouncing the cathedral root, stem and branch. Anyways, it looks like the more there are changes, the more things remain the same. Dumsor again? After it was banished by AMERI generators? Petrol prices on the roof? Are we no longer producing oil? Gh Cedi depreciation? Where are the economic wizards? When you are in opposition it is easy to say this and that, but when you’re in power, it is a different song you have to sing.